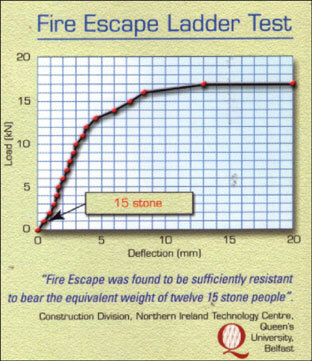 The above weights equate to more than a tonne on the Fire Escape Ladder. 4 No wall fixing brackets, 2 fixings to each, 8 in total - all fixings and drill bit supplied. Fire Escape (UK) Limited now have the answer - a fire escape ladder that will save lives.